What percentage of Muslims approve of radical Islam and terrorism? Normally, when people ask me about this question, I go straight to the 2013 Pew Research survey which I blogged about before. But now I have something even better. Here’s a post from Ben Shapiro at Breitbart News which looks at several polls from several different countries. 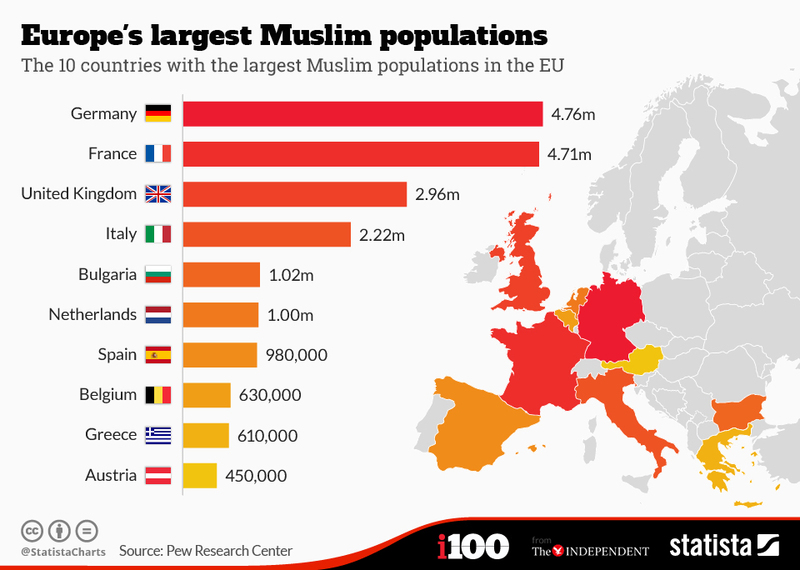 So, here is the evidence that the enemy we face is not a “tiny minority” of Muslims, let alone a rootless philosophy unconnected to Islam entirely. It’s not just the thousands of westerners now attempting to join ISIS. It’s millions of Muslims who support their general goals, even if they don’t support the group itself. Britain. In 2006, a poll for the Sunday Telegraph found that 40% of British Muslims wanted shariah law in the United Kingdom, and that 20% backed the 7/7 bombers.Another poll from that year showed that 45% of British Muslims said that 9/11 was an American/Israeli conspiracy; that poll showed that one-quarter of British Muslims believed that the 7/7 bombings were justified. Palestinian Areas. A poll in 2011 showed that 32% of Palestinians supported the brutal murder of five Israeli family members, including a three-month-old baby. In 2009, a poll showed that 78% of Palestinians had positive or mixed feelings about Osama Bin Laden. A 2013 poll showed 40% of Palestinians supporting suicide bombings and attacks against civilians. 89% favored sharia law. Currently, 89% of Palestinians support terror attacks on Israel. Pakistan. After the killing of Osama Bin Laden, the Gilani Foundation did a poll of Pakistanis and found that 51% of them grieved for the terrorist mastermind, with 44% of them stating that he was a martyr. In 2009, 26% of Pakistanis approved of attacks on US troops in Iraq. That number was 29% for troops in Afghanistan. Overall, 76% of Pakistanis wanted strict shariah law in every Islamic country. Morocco. A 2009 poll showed that 68% of Moroccans approved of terrorist attacks on US troops in Iraq; 61% backed attacks on American troops in Afghanistan as of 2006. 76% said they wanted strict sharia law in every Islamic country. Jordan. 72% of Jordanians backed terror attacks against US troops in Iraq as of 2009. In 2010, the terrorist group Hezbollah had a 55% approval rating; Hamas had a 60% approval rating. Indonesia: In 2009, a poll demonstrated that 26% of Indonesians approved of attacks on US troops in Iraq; 22% backed attacks on American troops in Afghanistan. 65% said they agreed with Al Qaeda on pushing US troops out of the Middle East. 49% said they supported strict sharia law in every Islamic country. 70% of Indonesians blamed 9/11 on the United States, Israel, someone else, or didn’t know. Just 30% said Al Qaeda was responsible. Egypt. As of 2009, 87% of Egyptians said they agreed with the goals of Al Qaeda in forcing the US to withdraw forces from the Middle East. 65% said they wanted strict sharia law in every Islamic country. As of that same date, 69% of Egyptians said they had either positive or mixed feelings about Osama Bin Laden. In 2010, 95% of Egyptians said it was good that Islam is playing a major role in politics. United States. A 2013 poll from Pew showed that 13% of American Muslims said that violence against civilians is often, sometimes or rarely justified to defend Islam. A 2011 poll from Pew showed that 21 percent of Muslims are concerned about extremism among Muslim Americans. 19 percent of American Muslims as of 2011 said they were either favorable toward Al Qaeda or didn’t know. In short, tens of millions of Muslims all over the world sympathize with the goals or tactics of terrorist groups – or both. That support is stronger outside the West, but it is present even in the West. Islamist extremism is not a passing or fading phenomenon – it is shockingly consistent over time. And the West’s attempts to brush off the ideology of fanaticism has been an overwhelming failure. A first-of-its-kind survey of the hordes of Syrian refugees entering Europe found 13% support the Islamic State. The poll should raise alarms about the risks posed by the resettlement of 10,000 refugees in the U.S. The poll of 900 Syrian refugees by the Arab Center for Research and Policy Studies also found that another 10% of the displaced Syrians have a lukewarm, but not entirely negative, view of the terror group. That means 23% — or almost 1 in 4 — could be susceptible to ISIS recruitment. It also means as many 2,500 of the 10,000 Syrian refugees that the Obama administration is resettling inside American cities are potential terrorist threats. Now contrast those facts with the views of Barack Obama and his allies in the mainstream media. “You know, I think that the way to understand this is there is an element growing out of Muslim communities in certain parts of the world that have perverted the religion, have embraced a nihilistic, violent, almost medieval interpretation of Islam, and they’re doing damage in a lot of countries around the world,” said Obama. So Obama denies all of these surveys, and instead invents a view of the world that is consistent with his feelings. A true man of the secular left. This gap between belief and reality explains why he is now bringing 200,000 Syrian Muslim refugees into America, keeping Syrian Christian refugees out of America, and generally underestimating Islamic State (ISIS / ISIL) because he cannot believe that radical Islam is anything for us to be concerned about. Is the government capable of vetting Syrian refugees to find threats? The administration argues that it’s conducting interviews with Syrians at camps in Turkey, Jordan and Lebanon. But without security forces on the ground in Syria who can verify details, there is no way to back-check a refugee’s story to see if he is telling the truth and is, in fact, not a security threat. Even when we had people on the ground in Iraq to screen refugees, terrorists got through the safety net. In 2011, for instance, two Kentucky immigrants who had been resettled as Iraqi refugees were busted for trying to buy stinger missiles for al-Qaida. It turned out that their fingerprints matched those linked to roadside bombs in Iraq. It was a major red flag that should have barred their entry, but U.S. screeners failed to take note. And the terrorists slipped into the U.S. The administration’s vetting process for the massive influx of Syrian refugees is completely unreliable, admits the FBI official in charge of such security background checks. “It’s not even close to being under control,” warned assistant FBI director Michael Steinbach. We should not be believing the man who promised us that we could keep our doctor, keep our health plans, and that our health insurance premiums would go down $2,500. He is either lying, or he likes to speak on matters where he is not competent to know the truth of the matter.